It (really) gets better! For LGBT people and everyone else. The world is being more open up, so is literary world. This one, Club Camilan 20, 30, 40, is an anthology written by three female (and lesbian) writers. 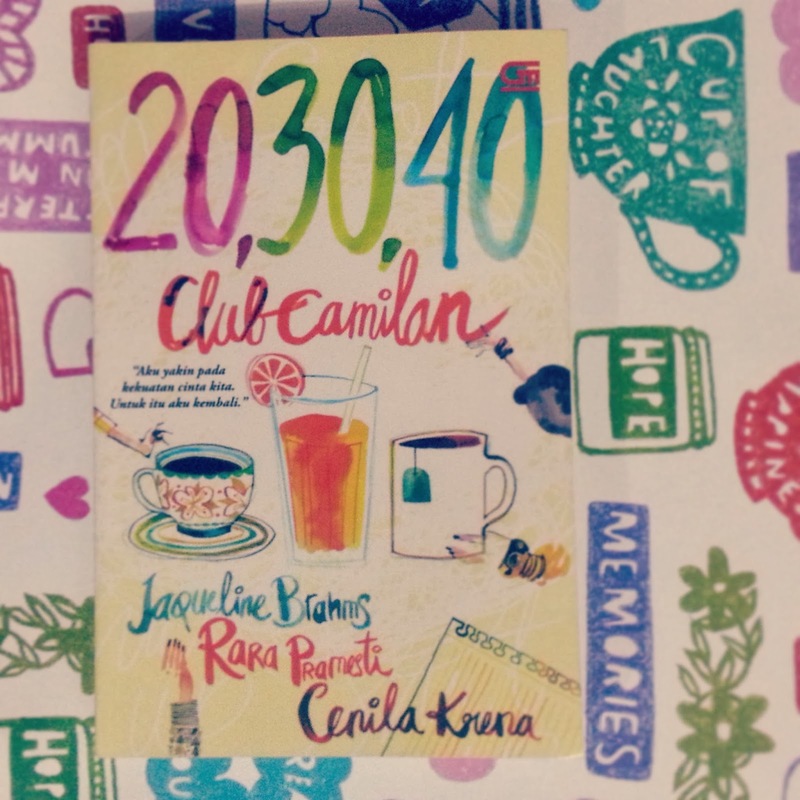 Previously, the first anthology under Club Camilan title was released a few years back. Now, the Sepoci Kopi website found and coached new talented writers to publish three love-themed novellas in one book. So...three writers from different ages (20, 30 and 40 years old) gathered their stories within much different writing style, characters and their background, lifestyles and their point of view in love and life. And more importantly, how they seek their freedom of being true to themselves in strict religious (read: judgmental), Eastern and patriarchal culture. 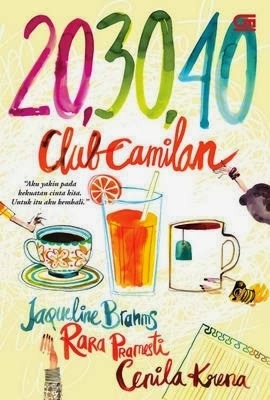 As the ages are the highlight of this second series, obviously the core of each novella---the self-battle, worry and aspiration---bears the power in creating natural conflicts that happened to Jaqueline Brahms, Rara Pramesti and Cenila Krena. Like Jaqueline, or Jags for short, the 20-year-old who just breaks up with her girlfriend and starts to dismiss the will and thought to have another one. But, her teenage characteristic dominates. In just almost a minute, she forgets it and finds to catch a girl she newly meets. From girl to another, her young life is spent with complicated yet challenging love story alongside college with full of hopes. And 10 years older, there's Rara, facing mid-life typical anxiety of her mother that urges her to get married soon (with a man she barely loves). Her brother's failed marriage turns him into a broken person and more pressure for Rara's whole family. While at work, Rara's best friend and dear colleague doesn't make things easier for her, when she finds out about Eki, the only girl in Rara's life who is much to her mother's dislike due to terrible incident in the past. In 40, Nila is having everything all people want in life. Successful career, sufficient wealth and yummy lifestyle. Not to mention her protection gadgets all around and bodyguards. Plus for her, two daughters she loves. She divorced her husband years ago so she could live with her lesbian girlfriend who later betrays her. Dealing with regret, she moves on and takes forgiveness as a new lesson in her next life phase. The book is quite a page turner. Three women speak up through three different stories to share something in common. Jaqs and Nila are friends with their own heterosexual yet gay-friendly best friends. Rara and Jaqs have to stand up for their sexual orientation in their family, although solved with different solutions made. Both Nila and Rara 'got the chance' to coming out with their boyfriend and husband. Three women whose lives are not connected with each other, writing aloud the situation and problems most lesbians (and other hetero women) have to deal with. Not only they represent the real lives of lesbian today, but also deliver optimism in the upcoming era for more understanding, tolerant and accepting society towards differences and gender equality. It is shown how they embrace their sexuality for its natural and common as it should be and their accepting close friends, like when Nila's best friend are against her will to marry so she can turn to be straight and when Eki's boy friend supports her relationship with Rara and Anne, Jaqs' best buddy, for her matchmaking effort. Once again, we all are also reminded by the existence of tolerance towards lesbians, even though in smallest scales. When we're mesmerized with interesting twists, the fight is still on. The characters depicted in the book are dragged into rational war talk about what cause lesbianism and what it is actually like, just how Rara does in her story. Also, it stays a long process to remove needless guilt that comes to them in living their lives to love a woman. However, Club Camilan 20, 30 40 is at its best in stating that being born as lesbian is a traumatic-free phenomenon, breaking the old negative (and subjective) assumption apart. Mixed feelings felt during reading, making the book a fast read and totally enjoyable. Doesn't care if you're straight or even LGBT. Written in simple languages by strong witted minded characters, the fun spirit blessed with humor doesn't go missing, but instead, pushes us back to realize, "oh what a life! ", to brace some touchy and teary parts in each story. Above all, no matter how old someone is, 20, 30 or 40, love stories are always the major interest where people can learn much from. I only read Clara Ng's books who talk about Lesbian. it must be interesting to read from other people,esp.because they are lesbian. gay, have read and seen a lot. lesbian? hmm..